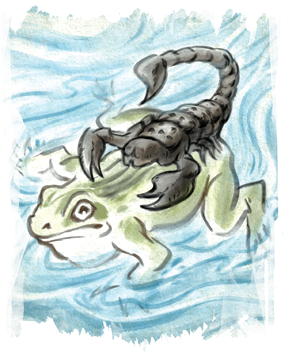 With six terrible words, the Kami Bayushi set his followers in the newly founded Scorpion Clan on a dark and dangerous path. Enemies loomed beyond Rokugan’s borders, but they also lurked within them. Bayushi swore to protect the Empire by any means necessary. Where the Code of Bushidō tied the Emperor’s Left and Right Hands—the courtiers of the Crane and the mighty legions of the Lion—the Emperor’s Underhand could still reach. Fantasy Flight Games is proud to present "The World, A Stage" by D.G. Laderoute, a new piece of fiction set in the world of Legend of the Five Rings! "The World, A Stage" focuses on the deceptive Scorpion Clan and can be downloaded here (2.0 mb). Be sure to check the Fantasy Flight Games website every other week for new Legend of the Five Rings fiction! Join us this Thursday, August 17th, at 1 p.m. EST on the Fantasy Flight Games Facebook Page for a special episode of L5RLive. Join Samurai from around the world as we stream the opening ceremonies of the Kiku Matsuri! Be sure to tweet in support of your clan to help them earn the Emperor's Favor! Be the villain and purchase Legend of the Five Rings: The Card Game (L5C01) at Gen Con or from your local retailer in the fourth quarter of 2017!